Welcome to the April 2018 issue of Black Grooves, sponsored by the Indiana University Archives of African American Music and Culture. This month’s top picks include a new recording of Florence Price’s Violin Concertos Nos. 1 and 2 performed by Er-Gene Kahng, and “American Songster” Dom Flemons’ collaboration with Smithsonian Folkways on an exploration of the music of Black Cowboys. April is Jazz Appreciation Month (JAM), with April 30th designated as International Jazz Appreciation Day. 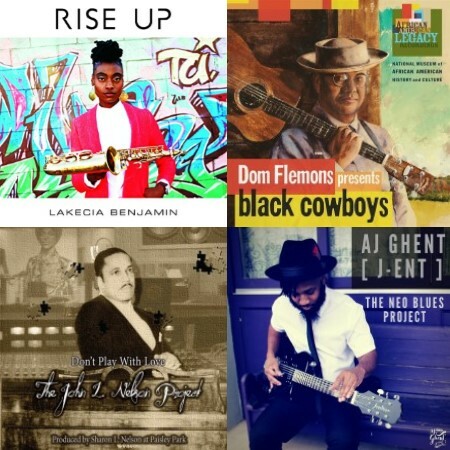 Jazz and social justice is the contextual lens for JAM this year, showcasing the progressive ways jazz continues to play a transformative role with respect to the civil rights of individuals from multiple facets of society. The jazz collaborations of both Wynton Marsalis Septet’s United We Sing and Keith Jarrett, Gary Peacock & Jack DeJohnette‘s After The Fall demonstrate the excellence that prevails when groups work collectively towards a common goal. Don’t Play with Love released by the John L. Nelson Project showcases the formidable talents of Prince’s father, John L. Nelson, both of whom fostered positive inspiration in others through their artistic legacies. Perseverance plays a central role in Sy Smith’s Sometimes a Rose Will Grow in Concrete and saxophonist Lekecia Benjamin’s Rise Up, as both albums urge continuance despite the cost. Young Street by bassist Reggie Young rounds out this category with a blend of jazz and funk. Other featured releases also contain a harmonious blending of genres. The Reverend Shawn Amos Breaks It Down and AJ Ghent’s The Neo Blues Project combine blues and rock. Stax Singles Vol. 4 – Rarities & The Best of the Rest is a collection of the label’s more obscure soul, rock, country, and gospel sides, while the Delvon Lamarr Organ Trio’s Close But No Cigar pays tribute to the legendary Stax studio band. Memphis Rent Party is a survey of regional music that serves as the soundtrack for Robert Gordon’s sixth book of the same title. 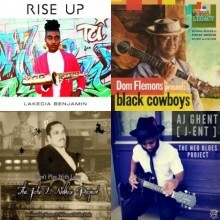 Additional releases include Mud Morganfield’s latest blues album They Call Me Mud, London rocker L.A. Salami’s sophomore album The City of Bootmakers, and a live gospel album, The Gospel Truth Live, by the late Marie Knight. Wrapping up this issue is a new book by ethnomusicologist Sandra Jean Graham, Spirituals and the Birth of the Black Entertainment Industry, and our compilation of March Releases of Note. This entry was posted in Blues, Classical Music, Folk and Country, Jazz, Popular, Rock, and Misc., Rhythm & Blues, Soul, Funk by aaamc. Bookmark the permalink.